I believe that Hindemith was able to play every orchestral instrument, though of course he is best-known for playing the viola. However, he certainly also played the clarinet and seems to have had a particular liking for it, writing not only a concerto but also a good deal of chamber music for it, which is gathered here. There are three serious concert works, the quartet, sonata and quintet, two examples of what he called Hausmusik, music for domestic consumption, and two pieces from one of his collections of Gebrauchsmusik, music intended for a social purpose. The quartet is written for the unusual combination of clarinet, violin, cello and piano. This was the same combination that Olivier Messiaen famously used in his Quatuor pour la fin du temps. Hindemith seems to have chosen this combination deliberately and modelled his writing to some extent on Brahms, though with his own kind of angular lyricism. Some people don’t care for this, but, once you are used to it, it has own rather expressionist beauty tinged with a pleasing touch of melancholy. The quartet is a large scale work in three movements, the first in a version of sonata form, the second featuring a long singing line while the third is contrapuntal, developing a theme first expounded canonically. This last movement is rather episodic, but the work as a whole is rewarding. The clarinet sonata is one of a number he wrote for a wind instrument with piano. Brahms again seem to be the model for this four movement work. The first features a good deal of imitative writing between the instrument and uses the clarinet in its low register a good deal. The second is a Scherzo which hops and skips along. The third is more serious, even sombre and rises to a passionate climax, while the fourth is a brief and cheerful rondo. The lighter works begin the second disc. Hindemith’s wife was a professional singer but also an amateur player of both the cello and the double bass. The composer wrote the Musikalisches Blumengärtlein und Leÿptziger Allerleÿ for them to play together. 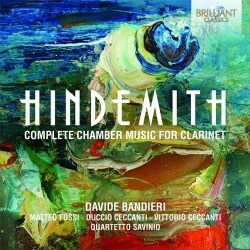 The idea of a set of duets for clarinet and double bass is absurd but Hindemith tackles them with zest. We have nine tiny pieces – five of them less than a minute long – full of wit, colour and variety. The Plöner Musiktag was a set of works written for a community music festival in the town of Plön. Hindemith wrote pieces for various combinations of instruments, to be played mainly by children and amateurs. He simplifies his idiom to suit these players but sacrifices none of his contrapuntal skill. The Zwei Duette for violin and clarinet show off his skill in writing for two voices with little chance of getting even three part chord, while the Variations find him turning out an elegant and well-formed work on a small scale. Ludus minor is a pendant to Hindemith’s great piano work Ludus Tonalis of two years earlier. It consists of three fugues with two intervening interludes, which repeats on a much smaller scale the way the big piano work is constructed. Again it shows off Hindemith’s contrapuntal skill and his sense of fun – this was another work for him to play with his wife. Finally we have the Clarinet Quintet, an early work here heard in a revision from the composer’s later years. He seems to have deliberately eschewed the examples of Mozart and Brahms – if there is any previous model it would be Weber’s clarinet quintet, in which the clarinet is very much primus inter pares rather than merging into the texture. The first movement is the longest, beginning with a fanfare-like passage and moving to a highly chromatic theme which is developed in a variety of moods and tempi. We then have a perky scherzo, whose frenetic high spirits suggest the troubled time in which the work was originally written and shows at one point that Hindemith had been listening to Stravinsky’s Soldier’s Tale to good effect. This scherzo requires the clarinettist to play the piccolo E flat clarinet rather than the usual B flat. The slow movement begins strangely, with swooping bird-like cries on a violin, suggesting Bartók’s night music, before moving to something more conventional. There is a brief, vigorous finale. I greatly enjoyed this collection. The performers are mostly Italian and several have connections with the Lausanne Chamber Orchestra. The clarinettist Davide Bandieri, the only player in all the works, has an attractive woody tone and fine phrasing and articulation. The various string players do the honours well, and the Quartetto Savinio help make a good team in the Variations and the Quintet. The recording, made in a church, sounds well. The sleevenote, in English only, features an attractive cover picture and notes which are rather light on dates and details but do give you details of the instruments Bandieri plays. There are other recordings of most of these works, but this appears to be the only version of Musikalisches Blumengärtlein und Leÿptziger Allerleÿ. If you care for the composer I would encourage you to go for this.